As we described in our first post, the first phase of our project was completing individual interviews with the Carpenter’s Kids families in Nzali. These interviews helped us gather background information on water use and general demographic and economic info. The next phase in our project was a group lesson to teach the families about water safety. With the help of Pastor Emanuel, the parish priest and our main partner in Nzali, we spread the word among the seventy Carpenter’s Kids families to come to the church for a lesson on safe water. It was a great feeling to walk into Nzali’s church, a small concrete building with a rusty metal roof, and see dozens of people crowded onto the church’s wooden benches, all there to learn about clean water. More people continued to walk in as we were preparing for the lesson, and by the time we began it was standing (or more accurately, floor-sitting) room only! Before we started the lesson, we handed out sheets outlining the water safety lesson in Swahili (Tanzania’s official language) and MadiDrop instructions in Swahili and Gogo (the local language in central Tanzania). We began our water education with a discussion of the general benefits of drinking water. We were encouraged to find that many of the parents were eager to state their thoughts and ask questions from the very beginning of our lesson. Next we discussed sources of drinking water, emphasizing that tap water and collected rainwater are the cleanest sources, and that shallow/unprotected wells and the river are the least clean sources and require more filtering and treatment to be safe to drink. As we learned in our interviews, most families in Nzali use water from the taps in the dry season, and water from the river and shallow wells in the rainy season. Water treatment thus becomes especially important in the rainy season. For our third topic of education we discussed waterborne and water-related illnesses. This is particularly important for young children, the elderly, and people infected with HIV/AIDS, the three most vulnerable groups to waterborne and water-related illnesses. Fourth, we taught different methods of water treatment: different kinds of filters, boiling, solar disinfection, chemical treatment, and MadiDrops. The parents were especially curious about ceramic filters like those PureMadi manufactures in South Africa. Peter, one of the two undergraduates from the Institute of Rural Development Planning (IRDP) who was helping us with our project, stepped in to give a lesson on these types of filters. 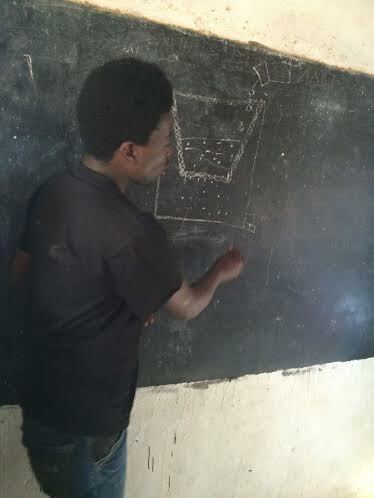 In watching Peter teach by drawing illustrations on the blackboard, we learned the importance of using visual aids and demonstrations when teaching in rural villages like Nzali. Many of the adults in Nzali are illiterate, so even after we had translated our water education handouts into Swahili and Gogo, this information was still incomprehensible to a number of the parents. This realization helped to spark the idea to create a MadiDrop instructional video with a Swahili voiceover, which we made in the following days with help from the IRDP students and left on a flash drive with Pastor Emanuel. Our fifth and final topic was water storage. Even water from the cleanest sources can become contaminated if stored improperly in a container without a top, a container kept outside, an unwashed container, or a container into which people dip their hands or a dirty cup to get the water. 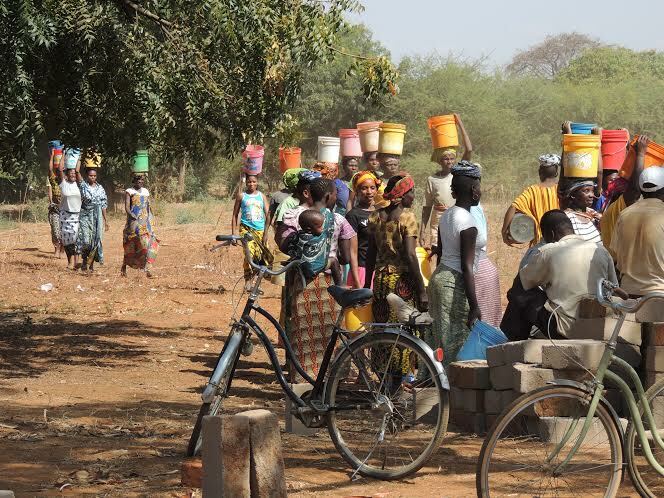 When selling MadiDrops, we provided containers with a top and a spigot to dispense the water. Over the next several days, we let the Carpenter’s Kids parents and guardians know that we would be available throughout each day at Pastor Emanuel’s house, next door to the church in Nzali, to answer any questions they might have. A number of parents came by, each with a long list of insightful questions. These questions ranged from whether or not the silver in MadiDrops could cause an allergic reaction to the logistics of how they would be able to purchase MadiDrops in future months and years after our departure from Nzali. We realized that with all of these questions and the high level of interest in MadiDrops, we would need someone that could continue to teach about MadiDrops after we left. We organized a group of half a dozen volunteers, our “MadiDrop Ambassadors,” to whom we gave more in-depth instruction on MadiDrops. We also provided them with access to educational resources, such as the Swahili MadiDrop instructional video we made, and the ability to email us questions through Pastor Emanuel. When Professor Jim Smith came to visit, our faculty advisor for the project and the inventor of the MadiDrop, he also spoke with the MadiDrop Ambassadors. The last phase of our project was selling the MadiDrops. To determine the best price for selling MadiDrops, we used economic data we collected in our initial interviews as well as information on price and payment method preferences from willingness-to-pay cards that the parents filled out. We determined that 6,000 Tanzanian Shillings ($3) would be a good price point for one MadiDrop, lasting 6 months. 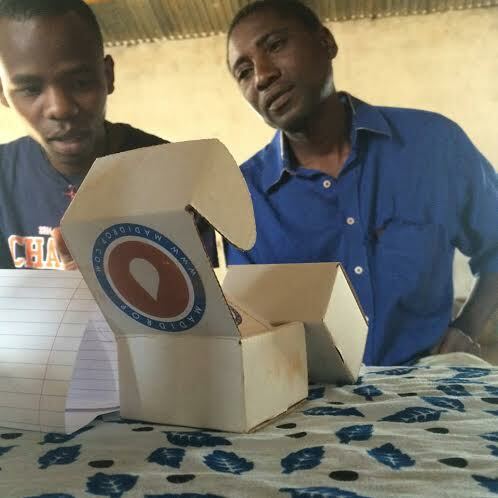 For two MadiDrops, we lowered the total price to 10,000 Tanzanian Shillings to incentivize purchasing a one-year supply. We also offered a volunteer option in which parents could help with the latrine project at the Nzali Primary School. A group from St. Paul’s, Ivy, the Episcopal church near Charlottesville that sponsors Nzali through the Carpenter’s Kids program, was constructing new self-composting toilets at the school and needed volunteer labor. We offered one MadiDrop in exchange for 3 hours of work, and two MadiDrops in exchange for 6 hours of work. 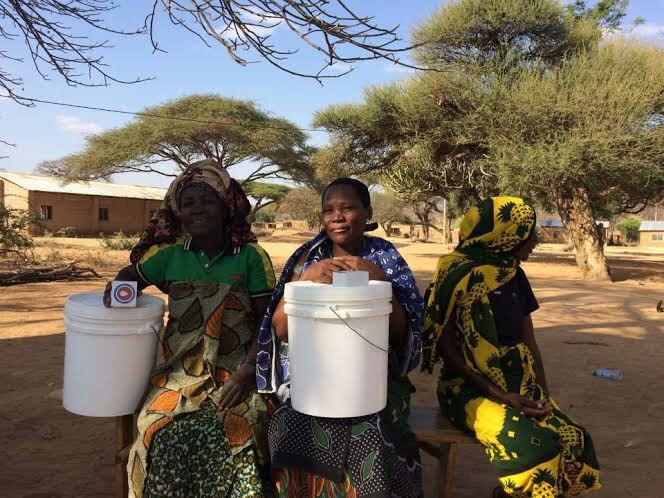 To thank the Carpenter’s Kids parents for helping us with our project, and to ensure each family would have a safe water storage container, we also used our research funding to provide a new 20 liter bucket with a top and spigot to each household that purchased a MadiDrop. Over the course of just five days of sales, 67 of the 70 Carpenter’s Kids families in Nzali came by the church and Pastor Emanuel’s house to purchase MadiDrops. A dozen of these were cash sales, and the remaining transactions were in exchange for volunteer labor. The volunteer option was hard work, each person carrying an average of ten 20 liter buckets of sand, water, or gravel, or 10 25lb concrete blocks up to a mile to the school. As our real research question was on the people’s willingness to pay for MadiDrops rather than their ability to pay, this was a very positive result. The Carpenter’s Kids families in Nzali were very willing to pay for or work for the MadiDrop. Because our project took place in the dry season, when families’ incomes (mostly from farming) are the lowest, most families did not have cash on short notice, but nearly all families were willing to give their time and labor in place of cash. If a monthly installment plan were available in future years, we feel this might make purchasing the MadiDrop even more accessible. In our willingness-to-pay surveys, many families expressed interest in an installment plan, dividing the MadiDrop payments into smaller monthly amounts. We couldn’t have asked for better results from the first introduction of MadiDrops in Nzali. Pastor Emanuel and the Carpenter’s Kids parents were eager to give us all the help and participation we needed throughout our project, and everyone we met expressed great interest in adopting MadiDrops as the solution for clean drinking water in Nzali households. We plan to send additional MadiDrops in six months’ time to replace those now in use, and we hope to expand the distribution of MadiDrops throughout the region next summer.